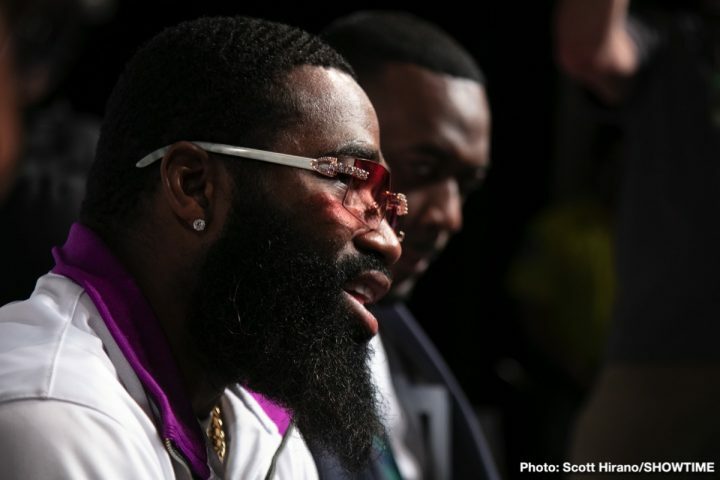 Adrien Broner: "I want to get some UK money"
By Trevor McIntryre: Adrien ‘The Problem’ Broner made it clear on Friday that he’s interested in fighting in the UK against one of the British fighters. Broner (33-4, 24 KOs) isn’t saying who in particular he’s hoping to fight, but it’s likely that it’s Amir Khan or Kell Brook. Kell still doesn’t have an opponent for his next fight in April. Broner might be the perfect guy for Brook to fight. Broner said in the interview on Friday that he didn’t sustain any punishment in his loss to Manny Pacquiao last January, so he should be able to get back in the ring for another fight. If Brook needs a good opponent for him to fight in April, Broner is there for him, as long as the money is to his liking. That would be up to Brook’s promoter whether he wants to put him in a risky fight against Broner. That’s a fight that Brook probably would have won easily if it had taken place three years ago before Kell’s losses to Gennady Golovkin and Errol Spence Jr. A lot has changed since those defeats. Brook looked poor in his recent fight against Michael Zerafa last December. That version of Brook will lose to Broner, as long as he makes sure to throw enough punches. “I didn’t take the punishment [against Manny Pacquiao]…I’d love to fight in my city, but I wanna go get some of that UK money. I want them to pay me in euros, that’s what I want. I can switch it back [to U.S dollars], and it would be more,” Broner said to Fighthype. “It don’t matter,” Broner added when asked if he had someone from the UK in mind that he wants to fight. Brook looks physically and mentally shot at this point in his career, and vulnerable against someone Broner. With Khan risking his neck facing World Boxing Organization welterweight champion Terence crawford on April 20th on ESPN PPV in New York, Brook need a big name opponent that will attract interest Stateside, as well as in the UK. That’s where Broner comes in. Assuming his adviser Al Haymon of Premier Boxing Champions can workout a deal with Brook’s promoters at Matchroom Sport, then there could be a nice fight between Kell and Adrien in the UK in April. It would be a quick turnaround for Broner, without question, but it sounds like he’s ready and willing to fight. If Brook’s promoter wants Broner as his next opponent, he’s going to have to open up his piggy bank and dig deep to come up with the kind of money that will make him want to come over to England to take the fight. Broner is talking Euro money for some reason. Whatever he wants to call the money, he’s going to want a lot to take on a still dangerous puncher like Brook. It’s important that Broner gets signed soon though, considering Brook’s next fight in April. There’s talk that Brook could be fighting Jessie Vargas next, but Broner would be a big upgrade over him in terms of popularity. It’s good news that Broner wants to come over to the UK to fight, but it might be a little too late. His stock has dropped off the cliff with his string of poor performances in the last two years of his career, and he’s not the star that he once was. Broner, 29, is still a young fighter, but his inability to beat the top fighters at welterweight division in the last couple of years has hurt his career. Will one of the UK promoters throw some crazy money at Broner to make him agree to come over and fight? Those are the two big makers at welterweight in the UK. It’s not unbeaten fringe contender/prospect Josh Kelly (8-0, 6 KOs). Broner wouldn’t take a fight with him, even though Matchroom Boxing promoter Eddie Hearn would love that fight if Broner were to show interest. Broner is currently going through a bit of a dry spell in his career, having lost 2 out of his last 3 fights. “AB,” as Broner calls himself, was beaten last month by WBA World welterweight champion Manny Pacquiao on SHOWTIME pay-per-view on January 19 at the MGM Grand in Las Vegas, Nevada. The fight was a big success, drawing 400,000 pay-per-view buys on SHOWTIME. Even though Broner lost the fight, he made good money and kept his name in the limelight. The judges had Pacquiao winning 117-111, 116-112 and 116-112. Broner landed only 50 punches in the entire fight. It wasn’t Broner’s punch accuracy that kept him from winning. It was his low work rate. Broner wasn’t willing to throw enough punches to give himself a chance of winning. Adrien looked like he was afraid of being countered by Pacquiao, so he was careful about when and where he would throw his shots. Coming off of a loss to Pacquiao, it puts Broner in a bad position right now for him to be talking about wanting to fight in the UK. Broner showed in in those fights that he’s not able to beat the better guys, but he can beat the weaker fighters without question. Mikey beat Broner easily, and Granados appeared to do enough to get the win. Broner’s loss to Pacquiao was a clear defeat that can’t be questioned. You can’t rule put what a promoter like Eddie Hearn would be willing to do when it comes to getting a guy like Broner over to the UK for a fight. In the States, Broner isn’t considered a big name anymore, but maybe he’s perceived differently elsewhere in the world. In that case, Broner would be the perfect guy to fight the winner or loser of the Khan vs. Brook fight. It would be a good career move for Broner to take a break from fighting in the United States right now, and instead fight overseas in the UK or somewhere in Europe. Broner’s recent failures against Pacquiao, Vargas and Garcia has hurt his popularity in the U.S, so he’d be wise to go to the UK and rebuild his name by beating someone like Book or Khan. He’s not going to fight someone like Conor Benn, Josh Kelly or Sam Eggington. It’s got to be a fighter with a big fan base, and that mean Brook or Khan.